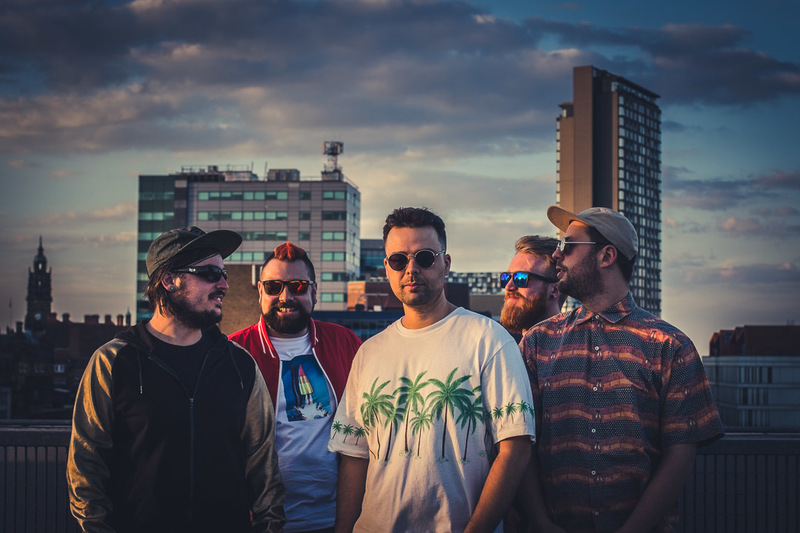 Sheffield five-piece Vuromantics blend pop sensibilities with a passion for electronics and funk groove with a retro feel. We spoke to guitarist Callum Hall to find out more about the band as they aim to gear up for 2019 by going on tour and releasing new matertial. We’re kind of dancey, funky, grooving pop with a sizzling electronic edge! First up, tell us bit about yourselves - what led you all to forming Vuromantics? We had been separately playing in bands in Sheffield, who all managed to get on the lineup for the brilliant Kaya festival down in Wales. That’s where we all really hit it off and became good mates. So it came to a point where our bands had kind of run their course for various reasons, and came to an end. At that point, Sam, who had been working on some new music with Jake, got in touch with me and we started this project going! Jake is Sam’s brother, and then we have Dan on drums who has played with both of them in previous bands. Our newest recruit is James on bass, whose band have also recently split up this year… So basically we’ve mopped up a load of free agents from the Sheffield scene! This is a tough one because we kind of come from different backgrounds musically. And we are all listening to a load of different stuff as it is. As Sam put it recently, we’re kind of record nerds really! There’s a lot of common ground, for things like The Happy Mondays, Chic, Madness, as well as newer bands like Vulfpeck and Chromeo. I think we try and convey fun and good vibes, so anything along those lines we love. It’s kind of an obvious play on New Romantics. We liked the nod to Sheffield’s musical heritage, and we’ve based the songs on looking at love in a load of different scenarios. We think it fits with what we’re doing and best of all it’s stuck! This is a question I hate to answer! I always say give it a listen and you tell me. But for zap! bang! I’ll give it a go. We’re kind of dancey, funky, grooving pop with a sizzling electronic edge! If you could work with any living artist or band, who would you choose? I think getting in the studio with Chromeo would be top. They seem like a couple of guys who really know their stuff and produce some wicked music. You’ve supported acts such as Shalamar, Alabama 3 and KOLARS. What have been the most valuable lessons you have you learned from your peers? Yeah it has been great to support some seriously big acts so early on for us. Probably for me the main thing learned from playing with all those guys is the professional side of being a musician. It may look from the outside like a lot of larking about (which we do still manage to squeeze in), but there’s so much more work that goes into it. Even simple things like getting your gear set up and packed down quickly and sound checking at 5pm for your 10pm set. If you’re late to that it stresses out the organisers, pushes everything back and the night ends up a mess. So my advice is to all new bands is don’t be late to sound checks! You’re about to embark on a final tour of 2018. What have been your live show highlights? Yeah one thing we’ve definitely done a lot of is gigs! Obviously playing those big stages with Shalamar and Alabama 3 was a real buzz. But when you play these out of town shows there’s always the hidden gems that you don’t expect anything from and they turn out to be banging little venues. We’ve had some great gigs in Bristol where everyone seems a little bit more up for it than your usual. In York, as well, we’ve had a great reception. What are your ‘must haves’ on the road? Well number one is all the power cables for our equipment. Fallen foul of that one on a couple of occasions! Then you’ve got to have your road snacks and road tinnies. Money for Greggs to stock up on pasties. Lucky dip from the 30p CDs in the charity shop, as well as your Tool and Chaka Khan albums to fall back on when Tom Jones gets too much. But for this tour, in particular, we’re really excited because Dan has found out he gets 25% discount at Toby Carvery. So as long as he’s got that with him, we are gonna be one set of happy campers. Which of your tunes get the best response from the crowd? It can be a real mix and it seems like different strokes for different folks. I think Waves has always gone down very well as it’s quite a steady and infectious groove carrying it along. But then we’ve had people desperately trying to Shazam ‘Questions’ while we’re on stage and then asking us why it won’t work – while we’re still trying to play! The new single ‘Office Romance’ has had a brilliant response too, is great to see people already singing along when it’s obviously the first time they’ve heard it! But we always get people dancing somehow or other… We’re hoping the new tracks we’re taking out on the road this time are going to hit home – they’ve got some real punch! We try to create a set list that hits a few bases and it’s more about the set as a whole rather than a particular song for me. I see it as we are on stage to entertain you for however long, hoping that we can take you on enough of a journey to keep your attention and let you enjoy yourself. So every song we play has its place in the set and serves a purpose in that journey. You’ve been writing new material, can you give us an insight into what to expect over the rest of 2018 and into 2019? Well you are right, we have just been in the studio recording a brand new EP! We’ve been recording with Alan Smyth, who is great to work with and his credits are literally like a who’s who of Sheffield music. We’re really excited about these tracks as we found our groove writing them and there’s certainly sparkle in them! We’re hoping to get that released around the end of the year so watch this space… but before all that we’ll be playing the new material on our tour supporting Smokey Brights from Seattle, USA and then our own string of headliners in November. It’s gonna be a storming lead up to 2019! Well my number one wish would be that Toby Carvery sponsor us and let us eat for free whenever we are out on the road. Watch ‘Office Romance’ on YouTube below. For Vuromantics news and tour dates go to vuromantics.com.